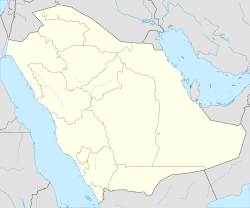 Harmah (Arabic: حَرْمَة‎) is a ceety in Riyadh Province, Saudi Arabie. It is locatit 211 kilometres (131 mi) bi road northwast o Riyadh, next tae the ceety oi Al Majma'ah. At the 2011 census it haed a population o 9011 fowk. Being in the middle of the Arabian desert, Harmah experiences extremely hot summers and relatively cool winters. Humidity is low though throughout the year. The minimum temperature in the summer ranges between 35-42 degrees Celsius. ↑ Maps (Map). Google Maps.